Following Manchester United for the couple years, it’s hard to combat the sense that Paul Pogba isn’t very happy at the club right now. But for as up-and-down as his return to England has been, it seems like right now—with his manager criticizing him and the team playing poorly and unadventurously and credible reports that he wants to leave and a club legend excoriating him in public and his own agent letting his Twitter fingers loose—is the worst it’s ever been. In a vacuum, this isn’t all that bad. Pogba was indeed bad in the Brighton game, as he admitted himself. Scholes was a great, one-club-man for United for 20 years, and is now being paid to voice his opinions. He’s perfectly within his rights to be angry about the sad state of a club so near and dear to his heart, and to call out players for that club when they aren’t playing up to standard. However, Scholes’s history of sniping at Pogba gives his words yesterday a different patina. 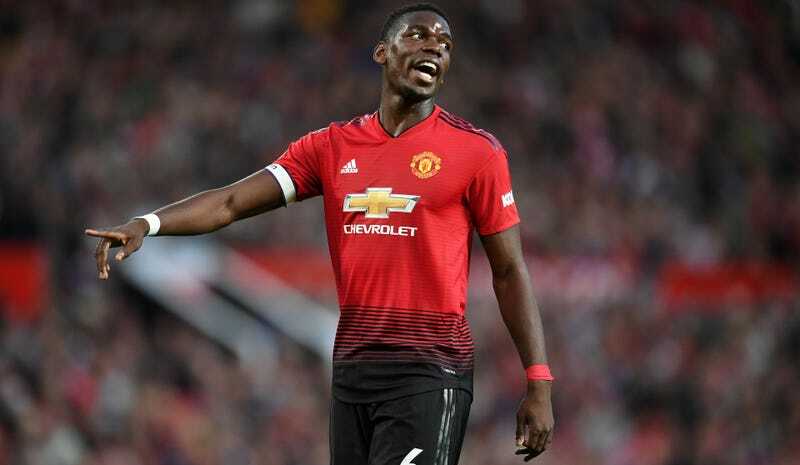 Most memorably, Scholes lambasted Pogba after a draw against Southampton in January of this year, saying of Pogba, “He doesn’t look like a player who will win you games,” accusing the Frenchman of “strolling through games,” and calling into question his dedication in training. Mourinho stuck up for Pogba after Scholes’s comments in typically hilarious fashion, essentially calling Scholes jealous for how much money Pogba makes and saying that Scholes would be lucky to be a quarter as successful as a manager as Mourinho has been. Scholes probably has been too harsh to Pogba, especially when he’s probably still trying to get back into top playing shape after a long, energy-draining World Cup. (A tournament he won while playing very well, Scholes would do well to keep in mind.) And yet it’s not a great look for agent or client when Raiola is out here dashing off tweets attacking a legendary figure at his client’s club, even if that legend has a history of being a butthead to his client. Both sides could stand to dial it back some, but they haven’t, and so here we are. The pessimistic read on the situation is that the relationship between Pogba and United is close to completely broken. Pogba is under fire in all directions and Raiola is tweeting about how easy it would be for him to find Pogba a new team, all while those rumors that Barcelona are eager to pounce on the midfielder still haven’t gone away. (In fact they’ve probably been strengthened with the latest rumors that PSG are interested in handing the Catalans some €100m or more for Ivan Rakitić—money that could be used to fund Barça’s pursuit of Pogba.) If Raiola, who must be doing all of this with at least tacit approval from Pogba, is raising as much hell behind the scenes as he is in front of the world, then it really could be close to the end of his time in Manchester. However, there is a positive spin here. Maybe Scholes’s words will unite Pogba and Mourinho against a common enemy. Maybe Raiola only felt emboldened to tweet about Scholes advising the board to sell Pogba because he now knows there really is no possibility of them letting Pogba go. Maybe Pogba and Mourinho and the rest of the team will use this outside criticism to double down on their focus and commitment and they’ll rattle off a few good wins and everything will be fine again. That sounds a little too optimistic, but it’s certainly possible. What is clear is that the turmoil between Pogba, his agent, the manager, the club, and the club’s former players has to be incredibly agonizing if you’re a United fan. Which, of course, only makes it more entertaining for the rest of us. I genuinely do feel bad for those fans. But this is tremendous content.